15 years of Sobaka.ru magazine! Our warmest congratulations to Sobaka.ru magazine on their 15h Anniversary! Dear editorial staff, thank you for your professionalism and hard work. We wish you inspiration for future stories and many years of happiness! 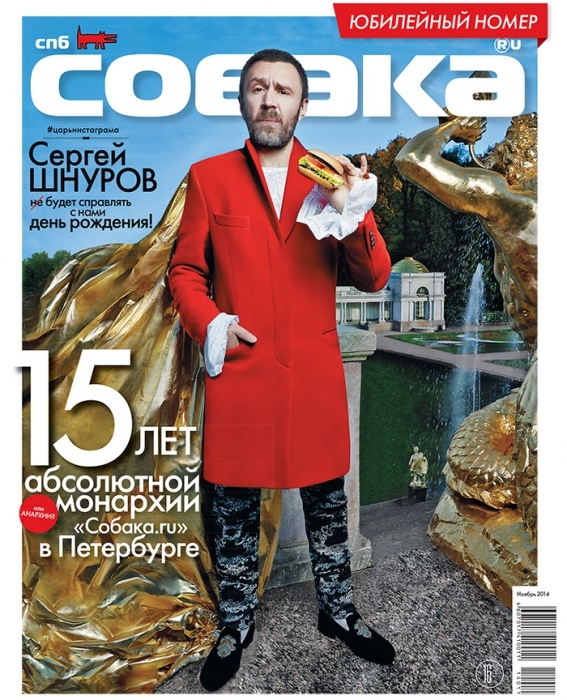 Danil Golovkin shot Sergey Shnurov in Peterhof for November issue. Andy Fiord Photo & Film Production team participated in the shooting. Andy Fiord, president and art-director of Andy Fiord Fashion Advertising, became the winner of the “Top 50. The most famous people of St. Petersburg” awards! Each year Sobaka magazine holds an open vote for the nominees in the “Top 50” awards. Among them: artists, movie and theatre stars, fashion-industry representatives, musicians, writers, businessmen, scientists, art historians and athletes who have reached the highest professional success this year. In his interview for the June issue of Sobaka magazine Andy Fiord told about his entrepreneur and astronomer careers, passion for fashion photography and the creation of fashion-business in Russia.